evangelical figure in the realm of interfaith dialogue and has spent the better part of the last decade engaged in discussions with Latter-day Saint scholars and some LDS church officials. His role has afforded him some high profile encounters typified by his role in the preliminary portion of Ravi Zacharias 2004 lecture at “An Evening of Friendship” in the Mormon Tabernacle at Temple Square in Salt Lake City. This event is central to the book’s occasion and content since it affords much of the impetus for Mouw’s role in Mormon/Evangelical dialogues and established him as both a respected and controversial figure in this arena. 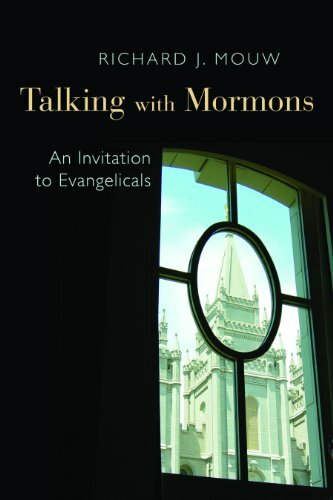 A review of his book Talking with Mormons: An Invitation to Evangelicals. In April 2013, the leaders at the Evangelical Ministries to New Religions (EMNR) put together an offiical statement regarding the former president of Fuller Seminary, Richard Mouw. The statement is located here along with the official link. Are "we evangelicals" guilty of bearing false witness when it comes to explaining Mormon doctrine? It is a rare event when a Christian theologian/philosopher is allowed to speak in the Mormon Tabernacle on Temple Square, but on November 14, 2004, Dr. Ravi Zacharias was given such an opportunity as he addressed the topic of Jesus as the Way, the Truth, and the Life. Unfortunately, much of what Dr. Zacharias had to say about the depravity of man, the necessity of the cross, the inability of man to save himself, and the all-sufficiency of Christ has taken a back seat due to remarks made prior to him taking the pulpit.